Hope you all are doing great. It has been a while since I posted a DIY tutorial on the blog. I just love making things and sharing it with you all. So today I am here with a tutorial on how you can make this lip shaped pouch. I find small pouches to be very handy (and not to mention utterly adorable). 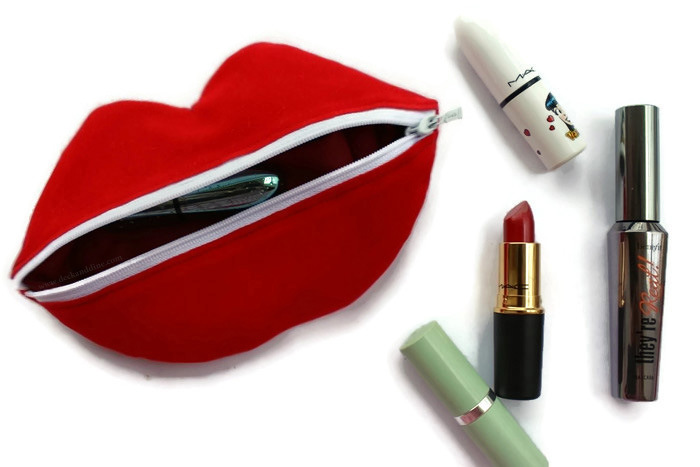 This pouch is so easy to make and has numerous uses; be it stuffing in your liners, lipsticks or basic makeup products for the weekend trip, or small things like keys, clips and bands that tend to get lost in your huge bag. You can even carry small notebooks and pen in them just in case creativity strikes or feminine stuff in case the "demons" strike, this pouch comes as savior each time. You can make as many pouches as you want and stuff your products accordingly. Fabric 1 (I used red, you can use any color of your choice). Fabric 2 (For lining, I used dark red, you can use any color of your choice). Threads matching the color of Fabric 1. Draw pattern the same way I did or you can take out the prints. If you are taking out prints then don’t resize or scale it. Place the patterns on the fabric and cut it accordingly. Now take the upper and bottom lips and place them to the front sides of the zipper. Make sure the right side of the fabric faces the right side of the zipper. Sew. I used my sewing machine, you can hand stitch if you don’t have one. Now place the other pattern over it with right side inside. (Follow image). The bottom part will be a little smaller than the upper part. Sew them together. You might need to unzip the zipper while sewing the two parts. 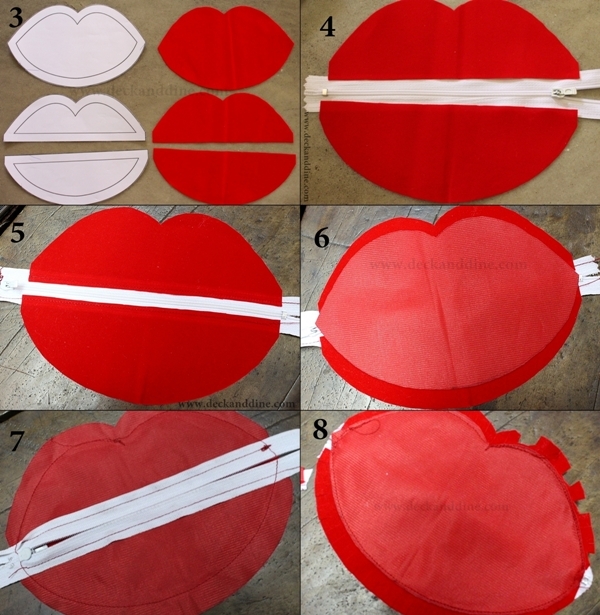 After you are done sewing, trim the edges of the zipper to match the shape of the lips. 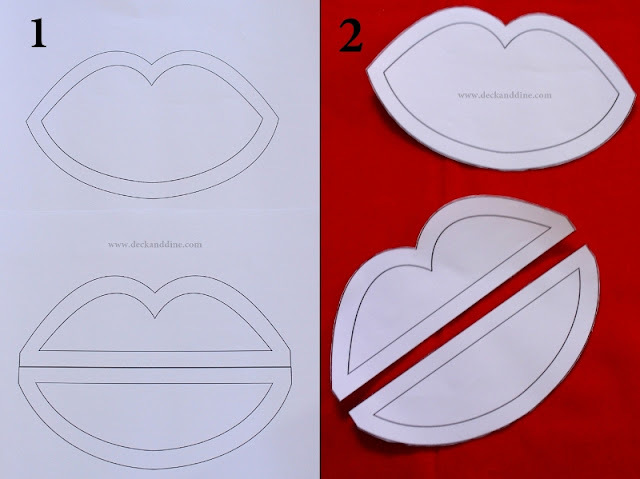 Now cut through the border of the upper part of the lips. You can clip out portions as well. (Follow Image). The more you clip out the less pucker your lips will look. I wanted my lip pouch a little puckered up, so I clipped out less. Well, lining is not compulsory here. I lined just to add a cushiony base for my makeup products and to make it look little more realistic. I just placed the fabric inside the pouch and sewed the borders. I will try this :) very creative ! This is fun 😃 Will try it for sure! 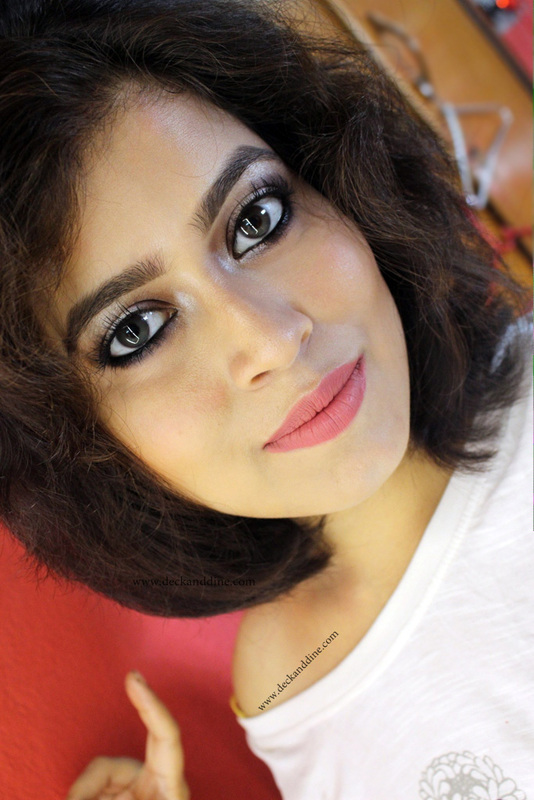 Madhu darling, you are the DIY Queen! Absolutely loved this. 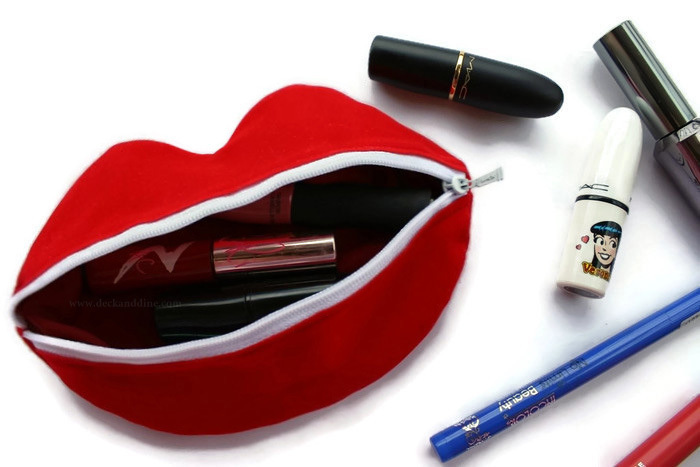 Much better than splurging hundreds of rupees on expensive makeup pouches. You're such a brilliant craftsman. I loved the way you made this cute little pouch. I too like craft work and if I get enough time, I will definitely make the same. You're my DIY Queen! Will definitely try it out! Damn girl... you are talented!